a holiday playlist for you to enjoy while you read through my gift guide & while you shop you heart away. i know, i know. thanksgiving hasn't even happened yet & this is my second christmas post. but what can i say? i've just got christmas on my brain guys. i think it's something to do with being a mom. i've totally got to prep in advance otherwise it all of a sudden is christmas & i haven't done half the things i wanted to, or i don't have enough time to buy & wrap gifts because i keep thinking it's far away. but it's not! anyways... i don't know about you but buying gifts for my husband & sisters/brothers/in-laws is always a tricky thing for me. 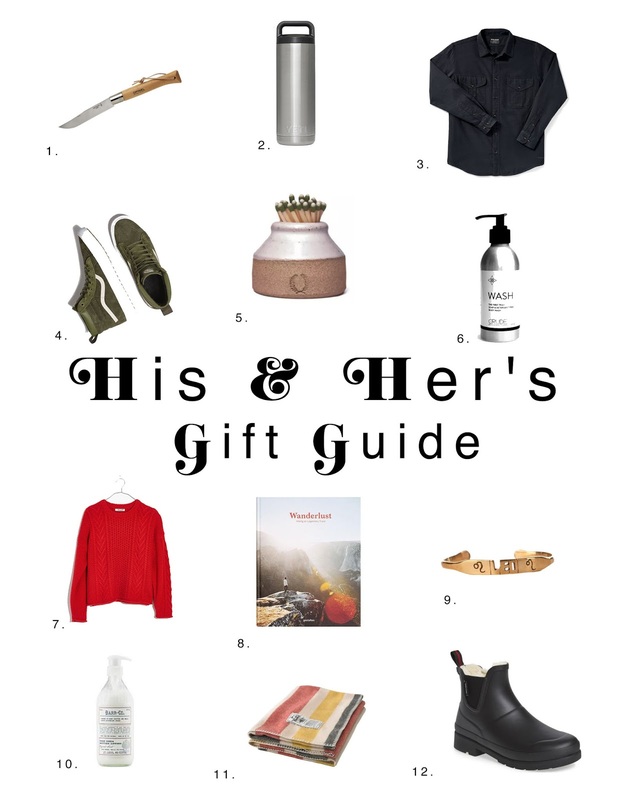 i'm not quite positive what to get them, so when i was shopping i made this gift guide of gifts anyone is sure to looooove. at least, i hope they do. let's do a quick run through. 1. convenient little folding knife, cause what man doesn't like a good pocket knife? 2. yeti tumbler. if you haven't tried one, you need to. they are the best. they keep your drinks cold or hot for hours & they don't sweat, which is the worst part of water bottles in my opinon. 3. handsome & cozy, what else does a guy need? 4. these vans are the best. they're all terrain & made specifically for cold, wet climates but still have the same great look of the beloved hightop. 5. the cutest little matchstick holder. or anything small holder. 6. crudes wash is by far the best bodywash. both my husband & i swear by it. it smells amazing, doesn't strip or dry out your skin & can double as a moisturizer. it is the best. 7. cable knit sweaters are a must for winter no matter where you live. 8. the wanderlust book has so many dreamy photos. it definitely makes you want to get out & see the world. perfect coffee table book. 9. star sign cuff, need i say more? anyone who resonates with their sign will love this. 10. barr-co moisturizer is so rich & creamy, it feels like a dream when you lather it on. plus the smell is heavenly. 11. cozy, wool throw, it's exactly what everyone needs in their homes this time of year. 12. lined chelsea rain boot. i love chelsea rainboots, they are so easy to wear & not nearly as bulky as your regular rainboot. adding a lining to them make them perfect.